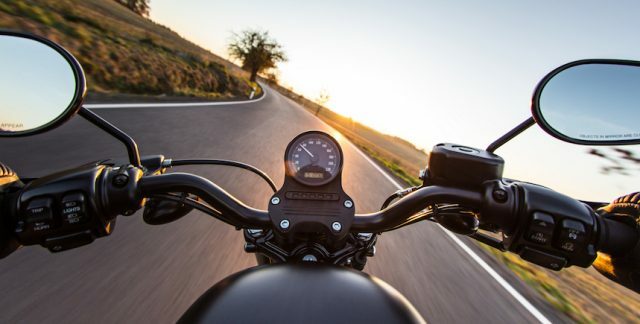 The prospect of motorcycling along an endless road often beckons the kid in you to just to set forth on a journey of self-exploration and road trips are the best way of doing that. Lets check out some best Indian road trip routes. 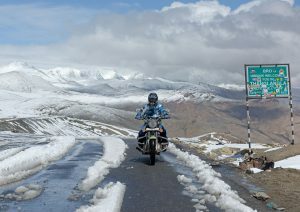 When we hear best Indian road trip routes we think of Leh. Take your adrenaline rush to a new level by exploring Khardung La, one of the world’s highest ‘motorable’ pass. Journey from Manali to Leh via motorbike will take you to the unexplored places which will be an experience of a lifetime. You will camp on the bank of sparkling high-altitude lakes, cross deserts and scale the high passes to take in a lifetime view over the biggest mountain range. You will experience a surprise at every turn of your bike. If you are looking for an ultimate mountain biking adventure then Manali is the place to be. 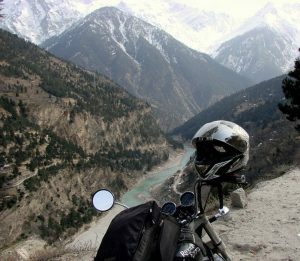 For all motorcycle road trips enthusiasts, this route will take you to some of the most unique and exclusive places of Himachal Pradesh. You will be astonished to see the oldest and largest monastic complex in the world, Spiti Valley. The awesome weather and awe-spring roads add to the joy of trekking here. If you want to see the highest village in the world, then opt for the Spiti valley route which ensures that the adrenaline keeps on flowing. One can take in the brilliant views of the Sutlej River, snow capped mountains, Pin valley and religious monasteries on their way to Manali. 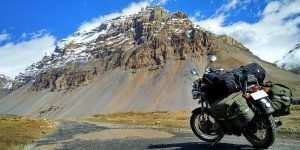 The rugged terrain along with the beautiful landscape attracts passionate bikers to explore the Spiti Valley trail and thus it makes the list of best Indian road trip routes. 3: How About Some Dune Bashing in the Thar? The motorcycling expedition is a great way to explore the classic heritage of a rich bygone era. Move your motorcycle up and down, experience the best of desert, a wildness which will never let you down. 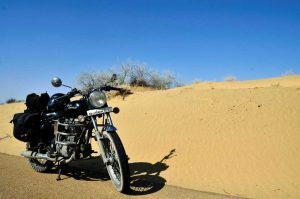 Motor biking on a desert is a fantastic experience which will take you to some of the sparsely populated regions. The trail will take you to the heritage forts, historical cities, arid deserts, Aravali ranges, and magnificent lakes. You will always remember the excitement of getting on your first motorcycle, and riding on it. Now, you can take that excitement to a new level by ridding your bike through the wettest place on the planet, Cherrapunji. A unique culture, beautiful scenery, cleanest villages, some of the highest waterfalls, this trail will take your motorcycling experience to an all new level. Ride alongside snow-covered peaks and flowing rivers with colorful prayer flags tied to your bike to ward off evil eyes. 2 people, 1 bike, and 70 continuous hairpin bands? Yes, you heard it right? Experience this bumpy ride in Kolli hills or mountains of death.. On your trail to 70 hairpin bends don’t forget to view the stunning Akash Ganga waterfalls, old Shiva temple, and pineapple farms. 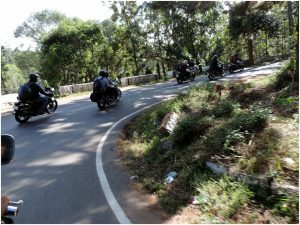 The 70 hairpin bends is exciting and challenging for every rider. 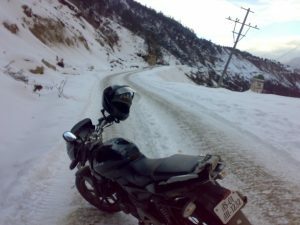 Riding through Darjeeling and Sikkim is always a great route, and the best way to do it is to start from Siliguri. Don’t miss out on riding through Kalimpong (and stopping at some of the colourful markets on your way). Pelling and Gangtok are also great pit stops. Have you ever ridden through a beautiful route that’s also really challenging? Make your way to Arunachal Pradesh to get through this route all the way to Tawang. There’s so much to see on this route that you will not only enjoy your ride there, you’ll also be able to soak up some pretty crazy tribal culture all through. Lots of pit stops on this one! Note- Tawang is closed to tourist during the winters. 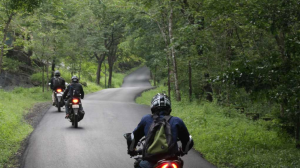 A motorcycle tour is certainly the best way to explore the hidden culture and secrets of India. Just be aware, be prepared and drive at safe speeds for a successful holiday. If you’re done with your day dreaming, after reading about such exclusive places, then pack your backpacks, and set forth on these adventurous expeditions. So that sums up the list of best Indian road trip routes. See, your bike must be calling you!